Carmel’s Victor Satlov soars to the basket as Kevin Carey looks to draw charge. CARMEL—A determined Carmel High boys basketball team came out of the huddle between the third and fourth quarters and broke open what was a one-point game by … Please login below or purchase a subscription to the Putnam County Courier to access this content. 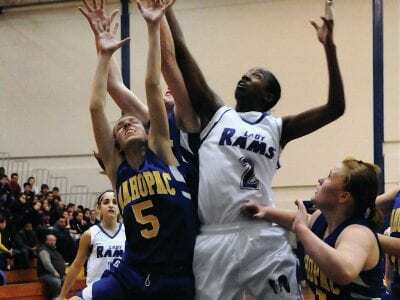 Brittany Horne of Carmel uses her height to grab rebound over Mahopac’s Samantha Nardo (5). CARMEL—The Carmel High girls basketball team picked up a couple of easy wins last week, rolling past overmatched Mahopac, 62-29, Saturday, after h… Please login below or purchase a subscription to the Putnam County Courier to access this content. PV’s Kris Castro improved to 32-3 with a win against Lourdes. PUTNAM VALLEY—The Putnam Valley wrestling team traveled to Long Island on Saturday to compete in the Stony Brook Duals, where the Tigers went head to head with Lindenhurst, Alb… Please login below or purchase a subscription to the Putnam County Courier to access this content. Brewster’s Charlie Carr swims backstroke at divisionals last week. BREWSTER—As a team, the Brewster High boys swim team may have come up short in their two meets this week, but they have plenty of individual performances to be happy about… Please login below or purchase a subscription to the Putnam County Courier to access this content. 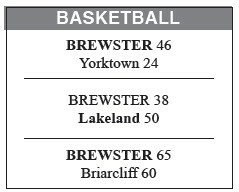 BREWSTER—The Brewster High boys basketball team cruised past Lakeland, 53-28, last Wednesday, before dropping a 52-50 decision Friday at Yorktown, in a pair of League 1-A games. The Bears also suffered a fourthquarter collapse the prio… Please login below or purchase a subscription to the Putnam County Courier to access this content. BREWSTER—The Brewster High girls basketball team picked up a 46- 24 victory over Yorktown last Friday, but the Bears didn’t fare as well at Lakeland two days earlier, coming up on the short end of a 50-38 verdict. Brewster opened t… Please login below or purchase a subscription to the Putnam County Courier to access this content. 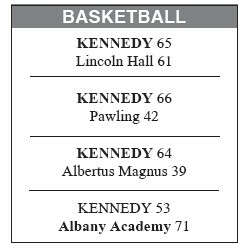 SOMERS—The Kennedy Catholic High boys basketball team picked up three wins last week – beating Lincoln Hall, 65-61, Friday, Pawling, 66- 42, the prior Wednesday, and Albertus Magnus, 64-39, two days earlier on the road. Kennedy a… Please login below or purchase a subscription to the Putnam County Courier to access this content. PUTNAM VALLEY—The John F. Kennedy Catholic/Putnam Valley high ice hockey team got two big league wins, defeating Mahopac on Sunday 1-0, and Friday beating Pawling 3-1. JFK/PV has been missing players most of the year, mostly due to ill… Please login below or purchase a subscription to the Putnam County Courier to access this content. The Mahopac wrestling team capped off a stretch of having three matches in three days with a 45-30 win over Beacon last Thursday. That followed two losses earlier in the week. The Indians were defeated by host Arlington 41-35 last Wednesday… Please login below or purchase a subscription to the Putnam County Courier to access this content.